Do you ever find yourself re-learning all kinds of things that you thought you really knew? I want to live in the moment called “kairos,” that is, in “sacred time, THE moment,” rather than in “chronos,” the day-to-day scramble to get more things done in less time, more efficiently. And I do get those “kairos moments,” as I call them, pretty regularly. Other phrases describe these experiences, too: “going with the flow,” “in the Tao,” “timelessness,” “Flow,” “enoughness.” It’s the sense, for me, of extreme “all right-ness,” and occurs when I’m painting, when I’m alone in nurturing solitude, or when I’m having a “d & r” — a “deep and real” encounter with a loved one. Recently, in light of how much I’m enjoying arting, I’ve signed up for a myriad of art journaling courses on-line, and amazon certainly knows by now just what books to suggest to me. So now I have potentially hours of videos to watch and books to peruse, and it’s so ironic that this abundance in my life has become a source of anxiety as well as the inspiration I was hoping for. I have the urge to tell dear spouse and dear son to just go away and leave me alone so that I can watch my videos online. I’ve found myself organizing the downloads efficiently and counting the hours of each, placing them on my to-do lists for the perfect times and days when I’ll most probably be unable to “produce” and will need to just rest. I worry that I won’t get them viewed before . . . . before what? Well, before it’s too late —- whatever that might mean! The calm voice just laughed a bit, and I remembered how many, many times these mental conversations have occurred. How many years does it take to deeply incorporate what I already know? Well, I guess that’s why it’s called “practice.” And instead of feeling badly about these repeated conversations, I actually felt rather kindly toward my inner voices. Too often I find myself fantasizing about how much I could do if I had just one extra hour of productivity a day. Then the other day a dear friend wrote in her blog about how much she wished she had more time to do all the wonderful things she wanted to do. It was an “aha!” moment for me, as this friend is an extremely energetic and generous woman whom I had been envying for the “so many more hours” of time that it seems she has to do what she wanted and/or felt called to do. This friendship has an added poignancy in that she has dealt with aggressive breast cancer this year. I witnessed her growing weaker, sicker, and more fatigued as her treatment progressed, and her slowly coming back to health and energy. It seemed to me that when she was at her worst, she had finally slowed down enough for me to keep up with her, energy-wise. While I have rejoiced as she has recovered, I have also longed to “recover” more energy and health, myself. My “aha!” was that if this energetic woman had so many things to do that she wished for more time in the day, then even if I had another hour or three in the day I would find worthy and wonderful things to completely fill them, and I would most probably keep wishing for more time, too. That could become a neverending cycle! I didn’t want that. It’s not actually more hours that I need, but more moments of that timelessness that I love. Dear friends, how do you deal with these sorts of things? Do you, too, long to go “deeper”? Do you find it easy to do so? I’d love to hear what you have to say. Alas, I am not yet that accepting, even after years of practice. (I wanna do what I wanna do, and I wanna do it NOW!!!) Sigh. Let me tell you about the photo above of a painting I did in my journal. It’s from a meditation where I prompted myself with “I will go up to a bowl filled with water, and see what I shall see. . . . ” I settled myself, relaxed, and set my intention that my meditation be healing, helpful, holy. “Healing, helpful, and holy” are words of Dr. Estes, who calls this type of meditation trance work, a way of working that can access parts of our psyche that we don’t use in day to day consensual reality. So. For all of you who might say, “Well, you just made all that up!” I answer, “Of course.” This is a vision that is already within me, that my meditation and readiness allowed me to “see” and “hear” in a way that I can understand and that is helpful to me in my day to day life. And yes, I also think that it came from outside of me, to the extent that all of us are connected in some way with all that is. I understand it as a type of waking dream. So what does it mean? For me, I’m taking it mean (“making meaning, making soul”) that there is within/around me an older, wise woman archetype, perhaps a symbol of the divine in feminine form, a helpful, far-seeing, compassionate being who is always available to comfort and encourage me. That by receiving her compassion I can be strengthened to myself be more compassionate to those around me. And, that it is good and helpful for me to do what I need to do to remember these qualities that are both already within me and are in potential for me. In order to remember these things, I need to step into moments of timelessness regularly, and not get into too heavy a relationship with my to-do lists and the stimulation of checking off just one more thing! May she say similar things to you, in ways that are immediately recognizable and helpful. A very short update to you: Remember when I said I had a biopsy done for an enlarged lymph gland? Well, found out today that it came back BENIGN. A lovely word! It was a big day, taking my son to the university for a half-day event, which means walking about three times as much as I usually do, even for a day when I exercise. Then I developed a migraine and sick tummy, worsened by taking Liberty home, and then going to the hospital for my appointment. After everything, I came home and collapsed. Slept for 2 hours. Still feel like a truck ran over me. Some days are like this. Even ones with GOOD NEWS in them. Blessings to you, and to me! As you have seen in some of my photos, I HAVE STARTED PAINTING. . . . AND. 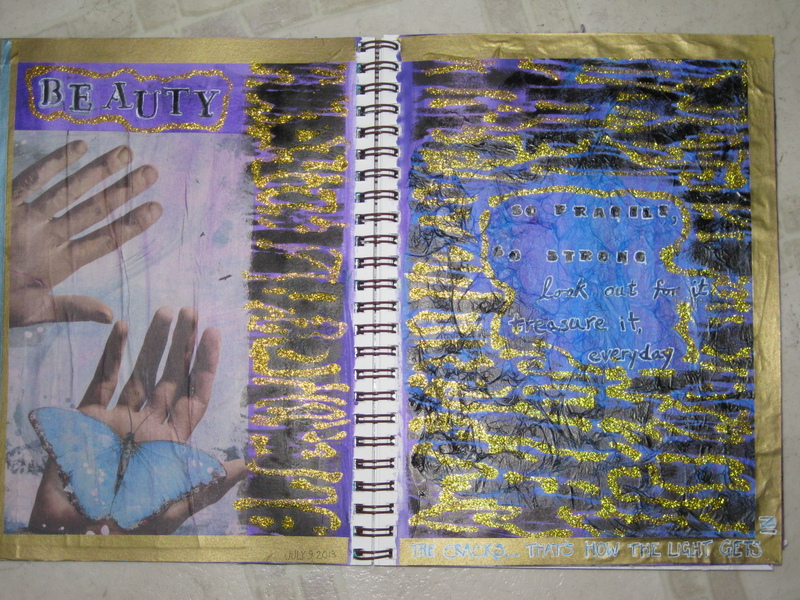 . . ART JOURNALING. . . AND I LOVE LOVE LOVE IT! The “cut to the chase story” is: I started painting in January of this year, and soon after, began art journaling. I can’t begin to put into words how much this has been a wonderful surprise gift in my life. The “story with the juicy details in it” is: Around Solstice/Christmas time of last year I began to realize that I was starting into a depression. Nothing was too serious, yet, but I felt strongly that I needed to do something to. .. . to what? I wondered. Sitting with it some more brought me the words “I need some colour in my life.” Well, I didn’t know what that meant. My days were already full; I don’t like to travel because most of the time it’s just too much trouble considering my health and all the planning that has to go into it; I already had some very good friends that I didn’t have time enough to see as much as I liked. The biggest thing was that I really didn’t have the energy to “go out there and make something happen”. Then “out of the blue” (does this ever happen to you? ), totally unconnected with the thoughts of beginning to sink into depression, I remembered a woman, an artist, who had been to two of the Mysterium trainings I had been at. The trainings, by Dr. Clarissa Pinkola Estes, are for “helping professionals,”, and have been held each summer for the past 3 years. They have been HUGE blessings in my life. So I googled my colleague, curious to see if she had a website. And DID she! Shiloh Sophia McCloud is an amazing, visionary artist, and entrepreneur. 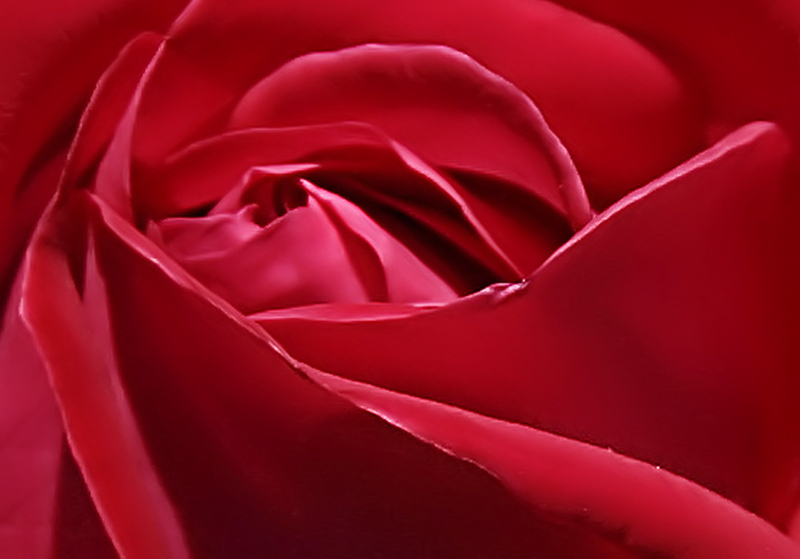 One of her on-line offerings is a year long course called the Red Madonna. In it, (totally summarizing here), each month she teaches through a series of videos how to paint a particular holy woman, while her mother, a writer, encourages the members to write a poem or prayer about the holy woman and how she exemplifies one of the Sephira from the Jewish Tree of Life teachings. It is geared towards both artists and non-artists alike — or shall I say, “not-yet-artists”? I couldn’t forget about the Red Madonna program. I tried to, as I didn’t feel I had time to start some new project. But I kept going back to the website, figuring out if I could do it somehow. One thing led to another and here we are on month 10 of the Red Madonna: Tree of Life, and I have 9 or 10 paintings I’ve completed. I had NEVER painted before. I mean, not even as a little kid do I EVER remember painting anything! I had taken piano lessons, nothing about art. 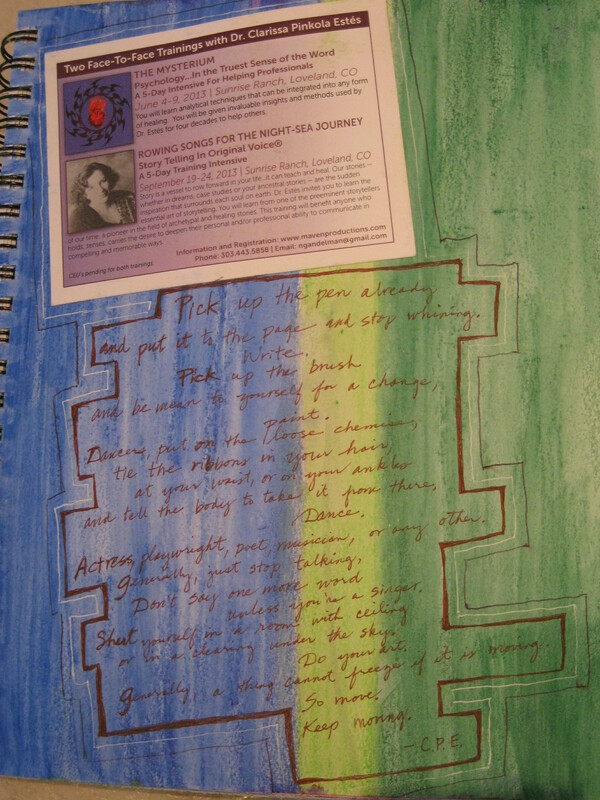 Not too long after that I began art journaling through on-line classes with Effy Wild. 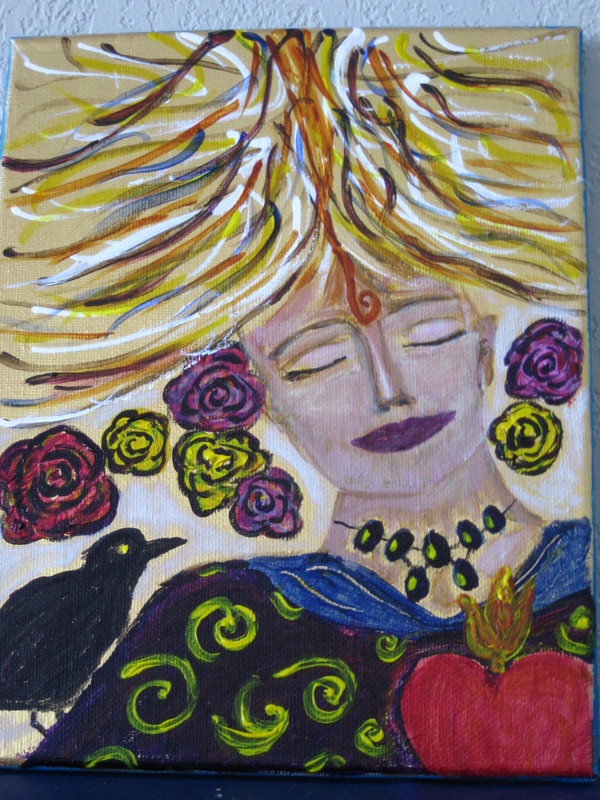 Both artists, like me, have a commitment to exploring the inner life of spirituality or the depth dimension. I didn’t sink into depression this year. In fact, it’s been one of the happiest years I’ve had. Maybe art really does save lives. I’m not technically proficient, but that’s never been a primary goal. As I’ve said in a previous post, I find that my inner symbolism has a new language with which to express itself, and I find that exciting and deeply satisfying. My intention is to include photos of my work with my posts, and sometimes tell you about the symbolism. For example (briefly), in “Listening for the Golden Visions” I’ve included a spiral at the “third eye” chakra, the locus of the inner eye, and an “egg” necklace of possibilities at the throat chakra, the source of my voice in the world. I find crows and ravens to be messengers and reminders of the Sacred Mystery within life, so she’s also listening to what the raven might tell her. There are seven roses; roses are my symbol of mysteries unfolding, and seven is an ancient sacred number which alludes to many meanings throughout history. What I can also tell you is that while it’s often quite challenging to find and to take the time to art, I either don’t have pain while I’m arting, or don’t notice the pain. That’s WONDERFUL! And I love these side effects: journals of images and a wall of canvases. Do you have a satisfying way to art? Has it helped you in any particular way? Is it difficult to take the time to actually do it?